Every Aspiring Digital Marketer needs to read this article. You will learn the ways to exploit the potential of Quora for Digital Marketing in this post. Here is a brief introduction of Quora. Quora is a question-answer community, where anyone can ask literally any question and anyone can weigh in to answer those questions. The answers get upvotes, comments, and shares as a token of appreciation. It is like one of those times when your uploaded picture gets like on Facebook. People in this community can follow each other. Doing so you can keep tabs on the work of people you admire. Quora clearly has all the traits that you look for in a Social Media Platform. 300 Million Monthly Quora users from diverse academic, professional & demographic backgrounds. Quorans engage through question answering, commenting, upvotes, sharing & messaging. Placement of advertisements on Quora takes place via text & promoted links. Advertisement Targeting takes place through contextual placement. Marketers, are you listening? That sounds like a perfect recipe for a social media platform. What makes Quora useful for Digital Marketing? A Digital Marketer’s job on Quora is to build brand awareness. By building brand awareness, you will give rise to a Funnel. Yes, building a marketing funnel is possible. This isn’t daydreaming. Quora acts as a framework for you to implement your long-term strategy. Quora acts as a great platform to build authority in the niche that you cater. If the information that you’re providing through answers & link share is really valuable to your target audience, then they will long to read your answers. They will not scroll down your answers without reading it. You will begin to get the answer requests once you establish your authority in the niche. Regular answering questions are the best & only ways of establishing authority. And believe me, it really doesn’t take long to reach that phase. Within days you will reach that place. Let’s say you cater to Digital Marketing niche, you have a Digital Marketing course on Udemy.com upon which you wish to increase the sales. What you can do with Quora is that you can keep answering questions related to Digital Marketing on Quora. Soon your identity will become synonymous with Digital Marketing, people will Direct Message you so that you can help them out with their queries. You can engage with people in the comment section. After a while, you can begin to mention at the end of your answers, that you have a course on Udemy.com which has ‘X’ star rating, since by now you have built your authority, so now you will be in the position to influence their decision to take your course. Let’s say the question that you just answered with your course’s mention garnered 20k views and 11k upvotes, how many of those do you think will convert? Quite a lot I would say because that answer is directed to your ideal target audience. Even if they don’t covert right away, at least they will be pulled down the funnel. Not to mention the shares, DM’s, and Mentions you can assimilate with that. Click-throughs are the traffic that you drive by sharing the link to your website on Quora. What you can do is, answer the question with hyperlinks pointing back to your website. Even better, you can camouflage those links with the text of your choice. For example, the “Digital Marketing” text can be concealed as a link to one of your blog posts about Digital Marketing. Likewise, you will be able to fetch additional traffic, who again is your target audience. If you haven’t tricked them in the answer or link, then those click-through’s will improve your site bounce rate. Because you have attracted qualified clicks. Maybe you have an opt-in form for Newsletter already triggered, the moment they opt-in your website, they are confronted by the opt-in form. As soon as they fill out that opt-in form they become your leads. You will be directed to his profile, from where you can find out whether he is on Facebook, LinkedIn, & Twitter. Similarly, you can find influencers according to the topic in every category, using this feature prevents you from spending on costly influencer marketing tools like Upfluence & NinjaOutreach. Not that these Influencer Search Engines are exploitative, as a matter of fact, these are great tools but costs a lot. Use the power of this question-answering community to build brand recognition. In Quora, there’s a feature that works really well for brand recognition. If you have a company with ‘xyz’ name and ‘x’ logo, then you can create a topic on Quora with your company’s name, and add your company’s logo to it along with the description of your company. Pretty cool, right?? Now every time, a question is asked regarding your company it will begin to add to your company’s topic that you created. As your brand’s recognition rises, people will start following your brand’s topic. Did I mention, that you can follow topics?? Now that people will follow your brand’s topic, so every time a question is asked regarding your company, they will be notified through their feed. Using Quora you can do keyword research for your upcoming blog. I mean let’s face it. Quora is the internet’s one of the most talked about place, involving a lot of text, you certainly can pick up, trends, phrases, keywords, headline ideas, words that are hot right now, and some unique keywords. 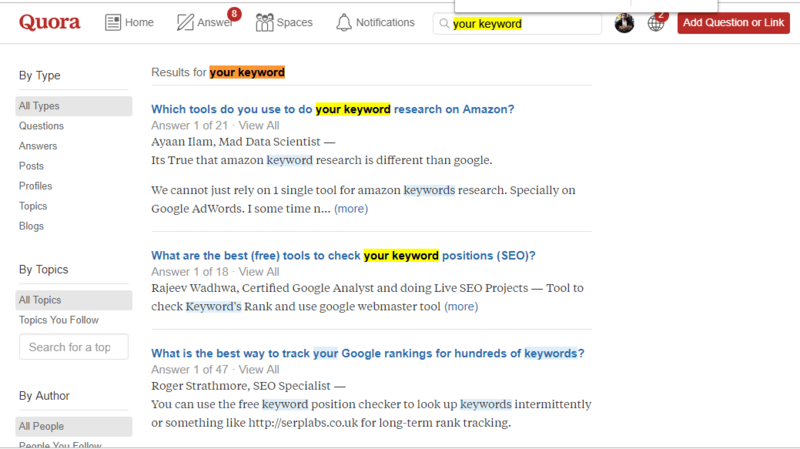 Using Quora, you will uncover unique keywords. The keywords that your target customers are already using. Just put your ‘keyword’ in search and press enter. As a result, it will reflect all the data recorded on Quora containing your keyword. This includes Questions, Answers, Topics, & Links as well. Using Quora, you can actually improve your SERP Performance. The magic with Quora is that even if you don’t rank on the 1st-page search results on Google; with the help of Quora your business can still be found on the first-page search result on Google. Let’s say you have a copywriting agency in Mumbai but in Mumbai for “Copywriting services” you are not ranking on the first page so what do you do? You answer questions on Quora by adding your agency in the answer, basically use Quora answer as a local directory. For example, if a question is asked, “What’s the best copywriting agency in Mumbai?” That’s your cue, you answer that question explaining how yours is the best. What happens next, is that if someone searches the same query on Google, the Quora question is ranked in the first-page result. People will click that link and thus your business will be found. use of on your web site? It looks great. Thank you for acknowledging, I’m using Astra Theme & designing pages using Elementor. Elementor works like a charm with Astra Theme. Thanks a lot! I’m glad that you found it useful. learn this submit and if I could I desire to counsel you some fascinating issues or tips. e-newsletter service. Do you’ve any? Kindly allow me know in order that I could subscribe. Thanks for the feedback, the RSS and email subscription is in the footer bar.